November 2018 – The official website of author and storyteller David Neilsen! It’s funny how things fall into place. A few months ago, I get the opportunity to read an advance copy of an upcoming ‘spooky’ Middle Grade novel and then submit a promotional blurb. 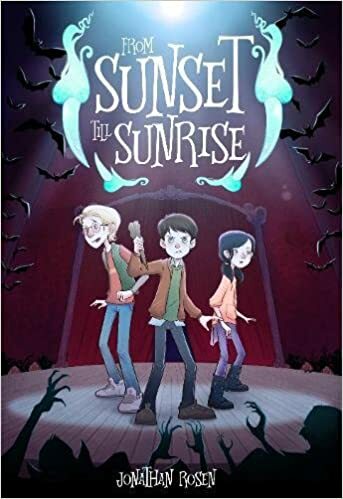 It’s a fun book, called From Sunset to Sunrise by Jonathan Rosen and it’s all about kids and vampires and mad scientists and other things that go bump in the night. A few months later, Jonathan drops me a Facebook line and invites me to join a fledgling group of other writers of Spooky Middle Grade books. I join up. Next thing I know we’re doing joint Skype visits and then there’s a website and now it’s a total thing! We’re from all over the country, and many of us will probably never meet the others in person, but online, we are a cohesive unit. I did my first joint Skype visit with the group on Halloween. It was awesome. Four of us in our respective corners talking to a class of kids excited to hear from us about our work, our stories, our lives. It was fun to share this with the other three writers, and we’ll be doing a lot more of these as more and more teachers reach out and sign up (the visits are free, of course). What struck me during the Skype was listening to the responses of the others and noting how similar they were to my own thoughts and stories. We really seemed to share a lot, and it was great to interact and work with like-minded people. There will be more to come, but for now, check out our site and find a Spooky Middle Grade writer near you! Author neilsendavidPosted on November 2, 2018 Categories UncategorizedLeave a comment on One of Us! One of Us!